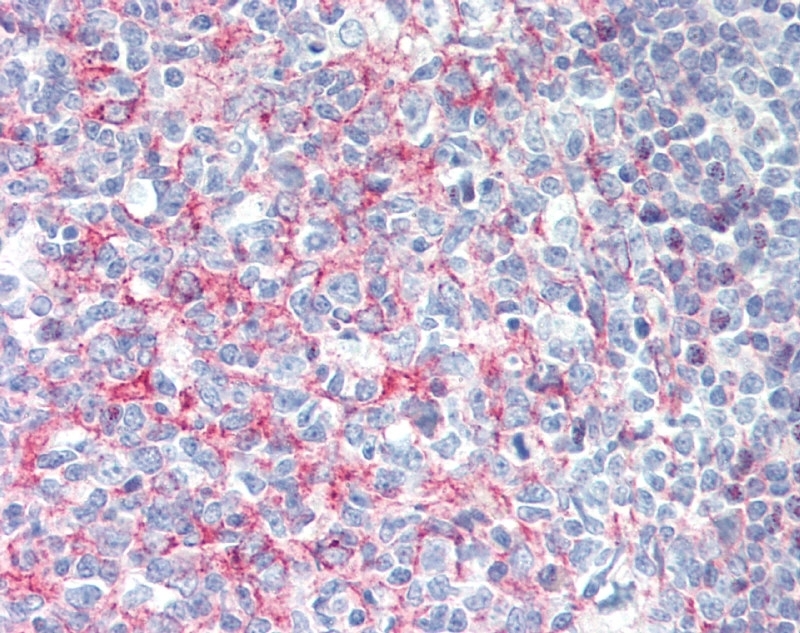 FFPE human tonsil stained with Mouse Anti-Human CD21 (MCA2499), biotinylated Anti-Mouse IgG and Streptavidin Alkaline Phosphatase (red). Nuclei were counterstained with hematoxylin. Mouse anti Human CD21, clone Bu33 recognizes human CD21, a ~145 kDa cell surface glycoprotein expressed by mature B lymphocytes, follicular dendritic cells, subsets of normal thymocytes and subsets of T cells. The CD21 molecule acts as a receptor for CD23, for complement components C3d, C3dg and iC3b and for Epstein Barr Virus. CD21 is part of the signalling complex that is linked to CD19, CD81 and phosphatidylinositol-3-kinase. Oxford University Press. (1997) Leucocyte Typing III. Garland Publishing, Inc. (1998) Leucocyte Typing VI. Thornton, C.A. et al. (2002) Expression of CD21 and CD23 during human fetal development. Pediatr Res. 52 (2): 245-50. J Comp Pathol. 124 (1): 83-7. Ling, N.R. et al. (1998) Origin and properties of soluble CD21 (CR2) in human blood. Clin Exp Immunol. 113 (3): 360-6. Wei, F. et al. (2001) A man who inherited his SRY gene and Leri-Weill dyschondrosteosis from his mother and neurofibromatosis type 1 from his father. Am J Med Genet. 102 (4): 353-8.